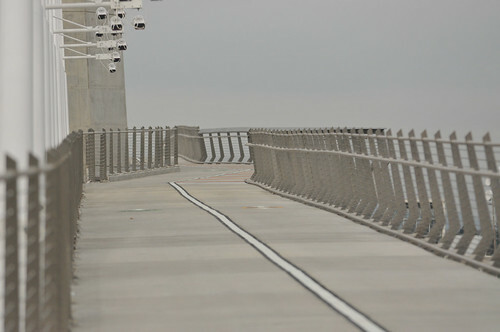 Looking west toward South Waterfront from the eastern end of the new bridge. There are just 179 days until the new Tilikum Crossing Bridge opens. This exciting new piece of infrastructure will grab a ton of headlines not just because it’s the first new bridge to be built across the Willamette in over 40 years — but because it’s one of the only spans in America where every mode will be allowed except for private cars. Let that sink in: No cars or trucks means this bridge — one-third of a mile in our dense, central city transportation network — will have only a fraction of the noise, toxic pollutants, and safety hazards that private motorized vehicles plague our city with each day. I’ve been begging TriMet to let me bike across it since the first media tours were given a few months ago. So far they’ve said no; but last week they were nice enough to give Michael Andersen and myself a private walking tour to help us understand the latest developments and features on the new bridge. We were joined TriMet’s Civil Engineer David Tertadian, their Public Information Officer Mary Fetsch, and TriMet Active Transportation Planner Jeff Owen. Get used to seeing a lot of these. Most of the major construction is done. For the next 4-5 months crews are doing mostly small stuff like tweaking handrails, training bus and rail operators, replacing some seismic joints at the east end of the bridge, and testing the various electrical systems. Before I even got on the bridge, I was impressed at how many bike-related changes have been made at the bridge’s intersection with SW Moody near the new OHSU/PSU Collaborative Life Sciences building. 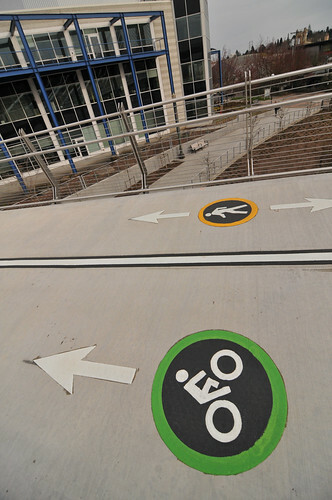 There are several new bike-only signals to help make the transition from the Moody cycle track, across the street, then onto the bridge’s bike path. Speaking of which, the start of the path (on the west side) begins with a big bike symbol and a riding area that is physically separated from the walking path via a curb and planted median. Also noteworthy is how the bike symbol is outlined in black. Owen, TriMet’s bike/walk specialist, said that was to help the white thermoplastic stand out better against the light grey pavement. I like that the bike path is physically separated at the start because it reinforces expectations about where people are supposed to walk and bike. Given how much biking and walking will happen on this bridge it will be very important for people to stay in the proper lane. 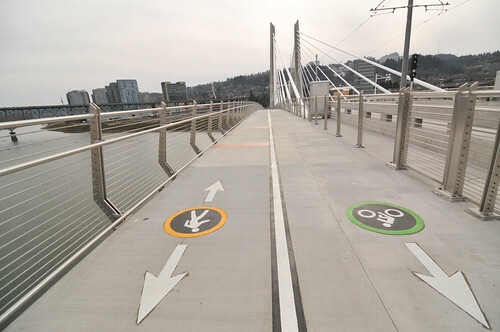 You’ll also notice the bike/walk lane markings, which are very similar to the ones used by Multnomah County on the Hawthorne Bridge (the only difference is that the bike marking is green instead of yellow). TriMet has also outlined the white center lane stripe with black to make it more visible. I was pleased to confirm that the width of the bike path stays a constant 7 feet, 8 inches the entire length of the bridge. 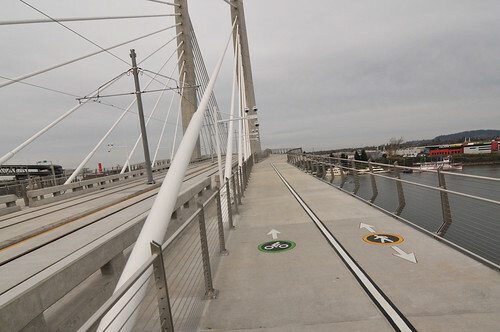 The walking path is 6 feet, four inches wide and balloons out to 13 feet, 4 inches wide at the “belvedere” viewing sections towards the middle of the span. Just east of the new Life Sciences Building, the physical separation ends and you come to a wide open area. You’ll notice there are crosswalks and traffic signals. If you’re a transportation wonk, this will be a fascinating intersection to watch once the bridge opens as it should be a bustling hive of multi-modal activity with people on foot, on bikes, in streetcars, buses (lines 9 and 17), and light rail trains. Owen informed us that in the future this will be an actual intersection with SW Bond Road, which is slated to be extended once OHSU further develops adjacent parcels (so add cars into that mix too!). Future intersection with SW Bond. 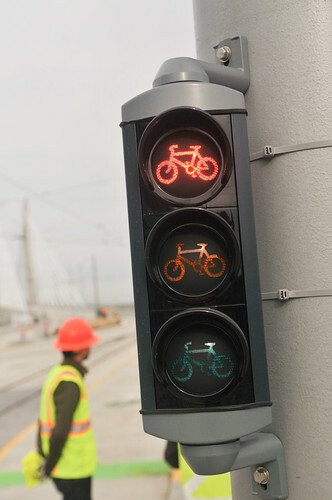 Since there’s a bicycle signal on the bridge span, I asked TriMet reps if it would have an automatic sensor loop or if people would be required to hit a button to get the light to change. They didn’t know the answer and I’m awaiting a clarification. UPDATE: I’ve confirmed that the bike signal will be triggered via a sensor loop embedded in the concrete. Speaking of sensors, we were very happy to hear TriMet plans to install two bicycle trip counters (one for each direction) similar to the one currently in use on the Hawthorne Bridge. Owen pointed out electrical boxes that have already been installed in expectation of the new counters, which will be ready to operate by the opening date in September. As we made our way further up the bridge and over the Willamette, I immediately noticed the incline. I’m very curious how hard/easy it will feel to pedal up this new bridge. TriMet says the “typical longitudinal slope” of the Tilikum is just under 5 percent (which is the ADA maximum). We’ve been told the incline is the same as the Morrison Bridge — but the Tilikum is twice as long (760 feet versus 1,720 feet respectively). Another striking difference you’ll feel riding on the Tilikum is its modern aesthetic and bold design. All the other bridges we ride over feel like either antiques (Steel, St. Johns, Broadway) or boring and uninspiring concrete slabs (Burnside and Morrison). The Tilikum, by comparison, is captivating. The sharp-edged, brushed aluminum unpainted stainless steel railings handrails and guardrails, juxtaposed with the tubular white cables that stretch skyward are a sight to behold. I appreciate that even despite concerns over path safety, TriMet has not littered the bridge with caution signs. Owen said that was by design. “The aesthetic vision was to be as simple as possible and to not have more signs than needed for safety.” I hope people walk and bike respectfully so TriMet doesn’t feel the need to add more signs or markings. One place where there’s likely to be some path congestion are the belvederes. These are the areas (on each side of the bridge) where TriMet wants people to stop, chat, and maybe take a photo and enjoy the view. 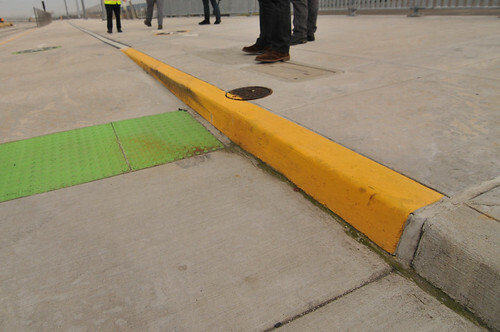 The only design features that mark the belvederes are a widening of the walking path, a widening of the upper railing that encourages you to lean on it with your forearms, and a series of orange thermoplastic pavement markings. As we made our way to the eastern landing of the bridge, I got to see how the new path interacts with the existing Esplanade path and station area near SE Water and Caruthers avenues. One thing that occurred to me is the balcony of the Portland Opera just became a much cooler place to hang out. View of Eastbank Esplanade, Portland Opera building (blue), and streetcar line (upper left). and Portland Opera building in the background. View from north path looking northeast toward OMSI. We looped back to SW Moody on the north side of the path. 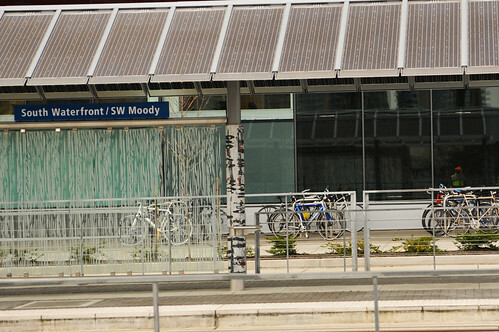 As we approached the Life Sciences building and the stations near Moody, I noticed a speed reader board. TriMet Engineer Dave Tertadian said that’s to make sure bus and train operators slow down through the bridge’s curves. The bus speed limit will be 25 mph and it will be 11-15 mph for trains. As we approached Moody, I loved the amount of life already present at the Life Sciences building. Starbucks and another retailer are taking advantage of what will be an almost emissions-free and relatively quiet bridge. They’ve put out a lot of chairs and even some plush couches for customers to sit on the sidewalk and enjoy the space. There is also ample bike parking on every side of the building. Overall, it’s hard to not be excited about what the Tilikum will mean for our bicycle network. While the connections to and from the bridge still leave something to be desired, the bikeway on the bridge itself will surely make it an instant favorite for thousands of daily riders. CORRECTION, 3/19 at 12:45 pm: This post initially said the bridge railings were made in part from “brushed aluminum.” That was incorrect. The material used is on the handrails and guardrails is unpainted steel. I regret error. Funny Irony side note, I watched this morning as a couple city vehicles were testing the intersection lights on SW Moody Ave… I thought it was funny that each car (3 total) only had one person in it, and were crossing back and forth on the bridge. I don’t get the irony. How many people do you want in a test car? Kudos to Tri-Met design staff for utilizing black edged thermo stencils for enhanced conspicuousness on this bikeway…something long utilized for automotive facilities but too often ignored for bikeways here and in other cities. 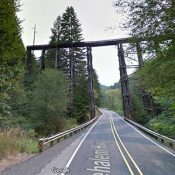 Can’t wait to bike across this bridge! I am really looking forward to using this bridge. My commute over the Hawthorn is a hazard rich environment. The east bound bridge ramp to south bound McGloughlin is one, and on the down hill glide toward Ladds Edition there are buses, and right turning vehicles to really make this section an obstacle course. Throw into that, the fact that other cyclists are riding with good speed close behind me, I always feel that if I have to brake, I will get creamed from behind. Please Tri-Met open the bridge to cyclists early, Please. Open early? What do you think this is, the “Bridge of the People”? I find it ironic that seemingly everyone *except* the public has been allowed to tour the new bridge. Why is that ironic? The bridge is not even open yet. I’m sure you can thank liability lawsuits for that. The Tilikum continues to be closed to the public for many reasons, safety and on-going construction work are two of the largest of those. Access requires special permits and protective wear. The bridge will be open for public preview during Bridge Pedal this August, and for those not wanting to participate in the Pedal, it will be open to walkers after the riders clear. After the Pedal, the bridge will close for final touches until it officially opens about a month later on Sept 12. I read (maybe here) that most of the work will be done well in advance of the opening. They then want an empty bridge to train their drivers all summer. That makes no sense to me. If a supervised professional driver is a threat to anyone this bridge has a problem. you are making up controversy. please stop. It’ll be open in 6 months. Uh….. training is good. We want trained drivers. I want the bridge opened early, but not at the expense of safety. This is a non-issue. I work in software and there’s no way we’d let customers use a product while it is being tested and trained on. Same principle applies here. When will we get reliable brake lights for bikes? That 5% grade incline is going to be a doozy until my pathetic little legs get conditioned to it, but overall I’m very excited! I ride the entire west side waterfront (steel bridge to OHSU tram) every day, and I’m looking forward to having another good bridge option that will hopefully ease congestion on the waterfront and other bridges. Agreed. The Morrison doesn’t see a lot of use due to the 5% grade – it definitely makes things a bit of a challenge on the uphill. It also means that bikes are going to be rocketing down the downhill, and I’d imagine that’s not going to be super-pleasant for pedestrians. There’s a real potential for serious injury if anyone suddenly wanders left into bike traffic in front of a fast-moving cyclist. It’s going to be really easy for a bike to exceed the speed limit on the downhill side. I’d be surprised if this bridge pulls away a lot of the traffic from the Hawthorne. Certainly, it’s going to grab anyone heading for south waterfront, but for a downtown commuter heading in from SE Portland, it would add at least 1/2 mile to the commute. For many people, that’s not an issue, but I think it’ll be a deterrent for a large number of folks overall. Tillicum is going to pull away a LOT of Hawthorne traffic for the first few days/weeks as people try it out, but it’ll be interesting if that sticks the following summer. My bakfiets and I are hopeful and a tiny bit scared about our new route to OHSU. Can’t decide if the hill down on the way there or the hill up on the way home (or the kid that doesn’t want to go see the doctors again) will be the worst part. I’m hoping the positives will far out-weigh the negatives. 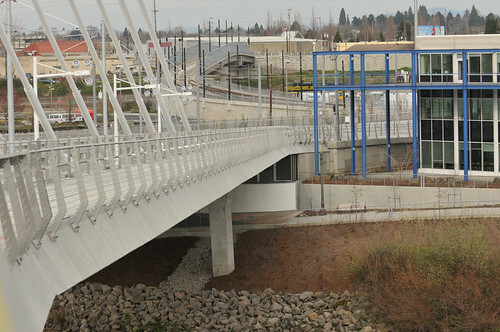 If folks can bakfiets across the Interstate Bridge…then this new bridge should be a “walk in the park”. Wonder if there is, or will be, bike counters on this bridge? A large fraction of people who cross Hawthorne are headed to OHSU. Even people like me who eschew the tram will be using Tilikum to vary their climb. How do you figure? The new path going from moody to the waterfront is pretty fast. What’s a half a mile? 3 minutes (at 10 mph). Hawthorn traffic is going fall – pretty dramatically. Really the only the people that live north of Division (lincoln really) to about Stark will the Hawthorn be a better option. Most of the traffic coming that uses Hawthorn to Clinton will likely use this Tillicum over the Hawthorn. Then throw in more people with direct lines from south of Powell, and the upcoming improvements on Foster TIllicum will easily carry way more bike traffic than Hawthorn. 2) it includes out-of-direction travel going southwest across the water and 3) The route north from the Tilikum on the westside is confusing and slow compared to the Clinton/Ladd/(Clay or Madison) route. The additional climbing is just the icing on the cake. This is a little hard to say without one of the routes actually begin open. You can play around with OpenStreetMap and your favorite routing engine to be sure. You may need to download the data and tweak it so it appears as open for your own purposes though. Also, if someone could bring it to my attention about 2-3 weeks before it’s open, I’ll update OpenStreetMap so everyone’s favorite bicycle routing engines will have it in time. I have never even thought about the grade. I always have complained about the poor connectivity on both ends of the Morrison, but never noticed the incline. I guess my teenage flatlander roots are finally dead…. Does anyone have a list of what the inclines are for the various bridges for comparison? Some even seem different depending on which direction your headed (e.g. : the Broadway seems steeper heading east than it does west (and certainly coming up Broadway or Lovejoy approaching it is a longer climb). Any potential for that railing/fencing to grab your handle bars? No more than the girders on the Broadway. Girders on the Broadway Bridge are treacherous. They’re grandfathered in because the bridge was 85 years old when the design standards for bicycle-friendly railings were developed. The only reason they’re not a mortal hazard is that they’re so huge that people naturally slow down and shy away from them. And they block a significant amount of cross-wind. 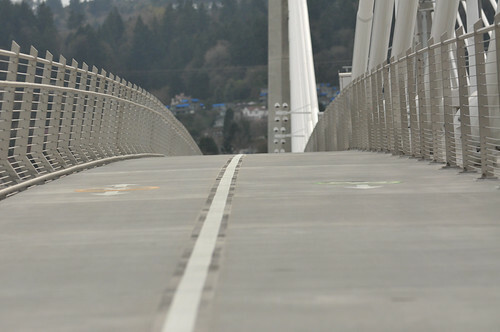 The Tilikum Bridge should have bicycle-friendly railings with a “Run Rail” installed from the get-go. See my post at the bottom of the page for details and references. Yes, those railings will grab your handlebars and knock you on down. They need to have a “Rub Rail” added. 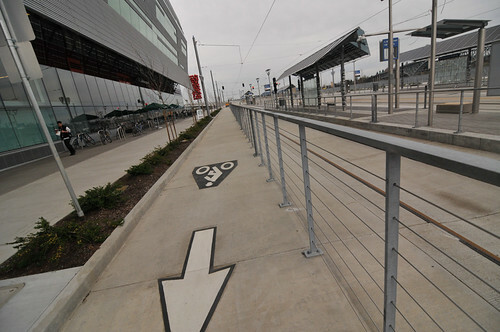 Someone didn’t read the design standards before ordering a mile of bicycle unfriendly railing. See my comment posted at this time, a few screens down. Fabulous! I can’t wait I can’t wait I can’t wait! Thanks for the preview! I love that the Life Sciences building has a Starbucks and Elephants deli facing directly onto the South Waterfront station. So many of the other transit centers on the MAX network are missing that kind of retail. I wish they used pigmented pavements for bike lanes/paths like they do in NL. It really makes it clear and obvious without having to think about where the bike lane is. I’ve been wondering how you are supposed to access the bridge from where the tracks cross at SE 4th/SE Water if you are heading east from the new SE Caruthers connection. 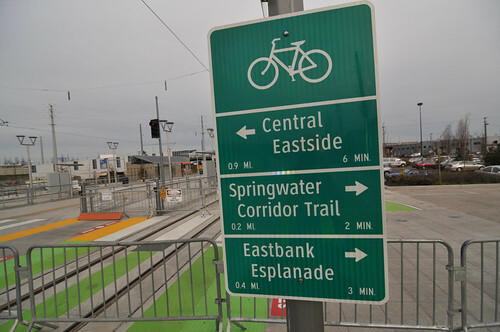 Will we be expected to turn left from SE 4th, or go to the Springwater and take the new path? Where on the bridge will the buskers be? By the Starbucks? You’ve got to have buskers or the whole thing won’t work. Have didgeridoo, will travel. They may be standing in the belvederes …after all buskers put the “B” in belvedere! Jonathan, did you get any idea why they aren’t doing any type of gates on both the paths and road when trains come through? Just seems weird to only have lights at these locations, where it would be pretty easy for people to walk or bike out in front of a train. There are gates for MAX lines further out (Beaverton, etc.). I am just surprised that they’re not here (at least on Moody). I think gates are only used in places where the MAX gets up to higher speeds. There aren’t any gates for light rail that I can think of in the Central City. True, but the MAX is actually running on real roads, with other vehicles and people there. Here it is not. Between the MAX, the streetcar and the #9 and #17 buses I think there will be plenty enough traffic for people to realize they’re crossing an actively use right of way. 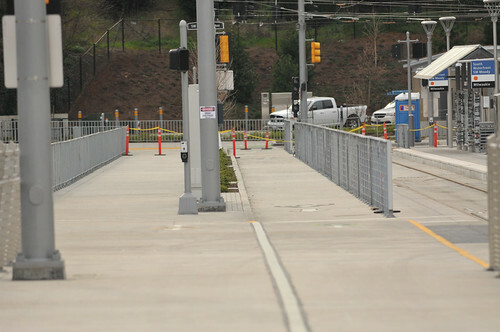 Why do we have at grade crossings around a brand new bridge in the first place? Yeah, that made no sense to me at all. That entire area has been completely redone in the last 4 years. Why couldn’t they have just made it go in a tunnel under the road/path? Because if it’s like the Interstate Drawbridge and where the southbound side of the cycleway crosses under I 5 at Jantzen Beach just before it rejoins the northbound side, it’d become low income housing whether it was intentional or not. Buses won’t cross the bikeway/ped path though. I just don’t see what it would have hurt, other than cost a little more, but it doesn’t look like a lot expenses have been spared on this project. Buses will cross the bikeway. 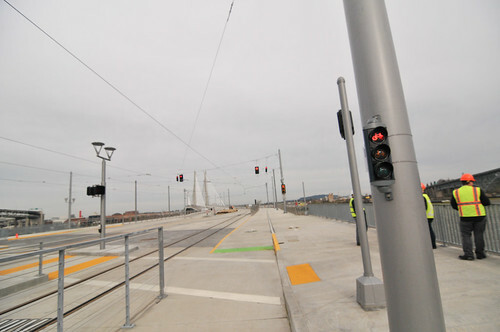 The #9 and #17 will start using the Harbor structure in September when the bridge opens. While I’m looking forward to riding this bridge like everyone else, I walked to the landing on the west side last week and the whole area is just kind of eerie. It reminded me of some of the pictures of an empty Dubai. All this development, Streetcar, bike lanes, and no people! Of course that would be the case with Tilikum, since it’s not open yet. But all of South Waterfront just seems very Potemkin village to me. I know South Waterfront stumbled out of the blocks because so many of the condos became available just as the housing market took a dip. But when are we going to get retail? When are we going to have a reason to go there? Will Tilikum help? Is it only a matter of time before the area reaches a critical mass? I work in the Collaborative Life Science Building and I would disagree with your assessment. Having done the SE Portland to Tram to OHSU on the hill bike commute prior to moving to the new building, the area WAS pretty desolate and ghost town-like. However, there is a lot of new retail going in between the new building and CHH/Tram. We still need a small grocery (Green Zebra would be great! ), but there are are ton of new (and newish) restaurants ranging from Subway to Cha Cha Cha to Bambuza to Little Big Burger to Elephants Deli and more. There are multiple new OHSU and Knight Cancer buildings slated to be build on the South Waterfront in the coming years so I think the busy-ness and business will only increase…even more so once the bridge is open. I’m glad to hear it, Dawn. It’s great that South Waterfront has an anchor tenant in OHSU that is doing very well. I just hope that it captures some of the vitality we see in the Pearl and the east side. its going to be 20 years from now, but its happening slowly. What time of day are you going there? Go in the middle of a sunny day our in the morning time. Last week it was during the lunch hour on a nice day. Prior to that, it was weekends (my son loves the tram). That’s weird. When I go through there at lunch there are all kinds of people at the shops in the new apartment building on the West side, and lots of people walking back and forth between the two OHSU buildings. But yes the area is definitely still a work in progress. I think the ‘South Waterfront is empty’ meme was true a couple years ago, but not any more. I’ve stopped for coffee a few times at Lovejoy Bakers and it’s really remarkable how many people you can see walking and cycling past on SW Moody. The number of occupied retail spaces has increased a lot in the last year. There are also 2 large buildings under construction, 6 buildings going through the permitting process and a quite a few retail spaces being fitted out right now. It definitely took longer than originally anticipated, but I would say that South Waterfront is actually turning into a very successful neighborhood. It does still needs a grocery store though. I think y’all need jobs first. Though commercial space is so overbuilt it’ll be a while before south waterfront sees much action. Unless they drop the price by a power of 10. There goes my dreams of gliding in a train across the Willamette at faster than a biking pace. Well, with that climb, I’m not going to beat the Max often. I believe that is just on the curved sections of track. I imagine the trains will go much faster on the center span. The track plan should be public record, so at least we should see where the initial signs and signals will be, and therefore, the speed zones. If someone can find the track plan, I’m pretty familiar with the TriMet MAX rulebook and could interpret. Flush with paint separation is the best design here because of the grade. There will be lots of riders keeping right (into the walking area) and tons of passing because commuter climbing speeds could vary between 5-15mph on a 5% grade. It’s unfortunate the red spots aren’t raised, though. Why is the bike lane so narrow? That looks like 5 feet to my eyeballing. What kind of volumes of bikes are they expecting on this bridge? It looks to me like faster cyclists passing slower ones are going to create conflict on this narrow bikeway from Day One. My eye had the same concern when looking at the photos…hope its an optical illusion! It’s 7 feet 8 inches per the article. But yeah, it should be at least a foot wide; 3 feet wider (10.5 feet) would be appropriate, especially with such little separation between bikes and pedestrians. Much better. Sounds like it was, as Todd suggested, an optical illusion. I should have read the article more carefully. The combined ped/bike path was originally only supposed to be 12 feet wide, in the end the committee voted to spend the extra 30 Million I think it was to expand it to 14. I am sure 20 would have bee nicer….but extra piers, well….cost? I’m glad they made it 14 instead of 12. 12 would not have been adequate, especially with railings on both sides. I wonder if 14′ will be enough 10, 20, 30 years from now. With the steep inclines, a spacious climbing lane for bikes would be great. I’m sure it will feel spacious for now, but then again, everyone thought that widening the Hawthorne from 6′ to 10′ would be plenty. Who’s to say the Tilikum won’t carry 10,000+ bikes every day a generation from now? A generation from now, I’ll wager, all the bridges will be carrying well more than that many people on bikes–and very few cars. Portland’s bound for a population collapse. Yes, of cars. Just like Tulsa. why is it so hard to get bikers out of traffic and walkways every where else. Lets be honest. If we tallied up the number of drunk driving convictions we wouldn’t have green commuters we would have people in need of addiction counselling. And its really no surprise Portland where you can get alcohol every quarter mile in any direction till you exit the city. 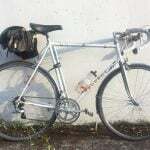 Stop selling biking like its something awesome that our city does to contribute and sell it for what it is the last ride for those that are not allowed to drive or cant afford to drive. Then get them Out of the traffic lanes and off the sidewalks. jonny, let’s be honest. Are you drunk right now? You’re drunk. Give me your keys. A quarter mile? Personally I wouldn’t live anywhere that it wasn’t closer than a fifth. Another bike signal to be ignored… Hopefully not though. I got to attend several meetings of Vera Katz’s planning task force for this really neat structure. Vera ran an open and often contentious planning process–she made sure everyone in the room got to stand up and speak their piece. Absolutely opposite to Mike Pullen’s railroading (!) 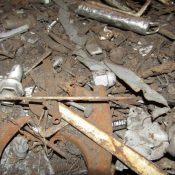 the Sellwood project–if one disagreed with PR Mike he would tell you to sit down and shut up. I brought up the issue of gradients and bicycles on Tillikum, especially on the downhill sides. I suggested that cyclists and pedestrians be constrained to opposite sides of the bridge, two-way paths for each: complete separation. My main concern was keeping freewheeling schussboomers out of the way of walkers. It did not work out that way; somebody implied that ADA would not allow it, which I find difficult to accept. Maybe this is thread is the place for a straw poll on those two possible designs. I, for one, would like to find out what prospective users, bikers and walkers, think. 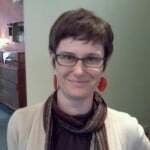 And, KUDOS TO VERA KATZ, FOR A TREMENDOUS JOB!!! 1. 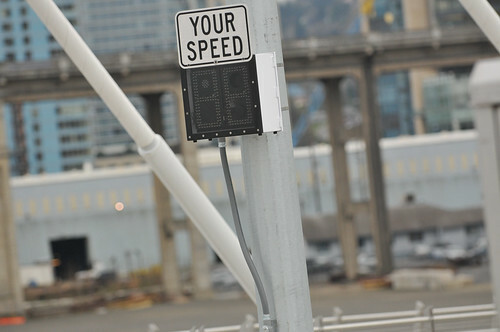 Will that “your speed” sign detect someone on a bike if there are no trimet vehicles around? That could make for some fun Cat 6 bragging…. 2. Florida DOT used to do black dashes in between the white dashes on State Road center lines. 3. I’ll second the request above for a list of the grades on the approaches to various bridges in the area. 4. I’m really excited about this project finishing. I’m waiting for rumors that Trimet is going to open the bridge to people on bikes & pedestrians permanently after Bridge Pedal instead of opening for a day then closing for another month. Come on, Trimet! Do it! Not just Florida DOT, pretty much any Sun Belt state that uses concrete instead of asphalt. Oklahoma and Texas do this on surfaces that won’t contrast white or orange, typical pattern is white stripe end to end to an equal length of black, then a standard width gap (usually twice the combined length of both the white and the black stripe, give or take, since there’s also a tendency to make sure all the stripes line up going across the highway rather than keep uniform spacing longitudinally). California does this between orange centerlines whether it needs it or not (double orange becomes orange/black/orange). You ever go down on the transit mall? There are probably 5+ cameras per block down there. Crazy. That’s so when a cyclist mows down a ped, they can immediately release the footage to the Oregonian, spawn oodles of press about the menace of scofflaw bicyclists, then use it to prosecute to the fullest extent. See? Even when we give them their own bridge, they still can’t be responsible! Or to catch the tack bandits! No, those are lights that illuminate the bridge at night. This is great, I’m excited to try it. > Starbucks and another retailer are taking advantage of what will be an almost emissions-free and relatively quiet bridge. It’d be absolutely silent and completely emissions free if Portland were to use electric buses like other cities do. Those railings on the Tilikum are dangerous — they’ll catch your handlebars if you brush against it, and send your body catapulting in one direction or another. They should have engineered it with a “Rub Rail” — a smooth portion of the railing from 3′ to 4′ in height that prevents a bicycle handlebar from catching on the railing. See Oregon Bicycle and Pedestrian Design Guide, Chapter 7 “Shared Use Paths, Design Standards section, p. 7-9, Figure 7-9. Unless they add a “Rub Rail” to the bridge, folks will be breaking their elbows, collarbones and skulls when they end up making contact with the railing unexpectedly. Like when a gust of winds hits them, when a dog runs in front of their path, or when the take a look at the stunning view and wobble a bit. For a proper example of a “Rub Rail” take a careful look at the railings on the Steel Bridge, lower deck. Built 15 years ago. There’s no way that bumping against those elbows will knock you down or pitch you into the river. They did it right, 15 years ago. 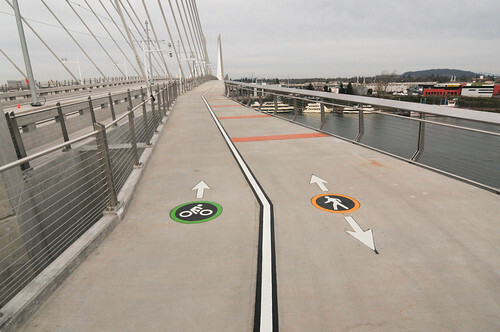 To save the collarbones of you and your friends, send an email to safe@portlandoregon.gov and ask them to retrofit the Tilikum Bridge with “Rub Rails” before its opened to traffic, as per the Oregon Bicycle and Pedestrian Design Guide, Figure 7-9. Ted, yes exactly my feelings on it. The rail you refer to are probably like the ones on Going coming down onto Swan Island? are you kidding me? isn’t most any vertical surface dangerous on a bike if you’re not paying attention? or in a car for that matter most anywhere? wild hyperbole aside, lets hope everyone can simply pay attention and ride within their ability and with a safe rate of speed according to the conditions. other than that, this is some fabulous fictional writing here. You’ve covered virtually every single possible scenario. I’d rather just ride in a straight line and pay attention to what I’m doing instead of instantly demanding changes to a wonderful facility to accommodate a bunch of “what ifs”. No. A properly designed railing for bikes will not catch handlebars and send the rider crashing to the ground. There’s a low penalty cost for brushing against it. An improperly designed railing will break your bones if you make contact with it. in terms of how dangerous it is when a bicycle handlebars makes contact with the vertical surface of the railing. I’m not saying that anyone who brushes up against the Tilikum railing is going to fall, but its much more likely because of the way the railing was designed. If you line up a bunch of “what ifs” then pretty soon you get those things happening and people being injured. It’s about designing a safe environment. It’s not that hard. 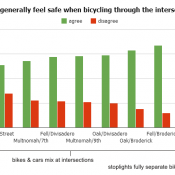 There’s studies, handbooks, that folks put a lot of time and effort into to make sure that over time the built environment is a as safe as possible of a place to operate a bicycle. But it takes attention to detail. That’s why they create design standards, and hire engineers to make sure things are built correctly. But, things are overlooked, and that’s why there are safety complaint hotlines and citizen watchdog groups. 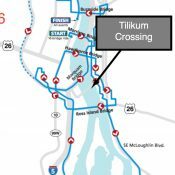 If you have a concern about the Tilikum Bridge or any other piece of infrastructure in town, you can make your travel safer, and the travel of those around you by reporting it to the appropriate government office. You’re forgetting about one other, almost guaranteed scenario: the dangerous close-passer. It’s happened at least once on a different bridge, and is not unlikely at all. In the event that your straight line is forcibly disrupted, I’ll bet you’d be glad not to have sharp railing edges be the first thing you hit. Freeways and other roads have guard rails and Jersey barriers even though most drivers know how to drive in a straight line. Those barriers are designed to be hit by moving cars and in such a way as to facilitate the sliding of a moving car so as to gently guide it back to or keep it on the roadway, not grab it and flip it into oncoming traffic. These railings almost serve no purpose, as they likely wouldn’t stop a runaway bus from careening onto the path, and they might not prevent a cyclist who hits it from flipping over it into the bridge supports or onto the tracks. Going over the top of that railing the wrong way would be torture as well. The only purpose they serve is to scare cyclists away from the edge so they don’t get too close in the first place. If safety and protection of bridge users is the goal, these railings don’t accomplish it very well. I’m guessing they are there to keep pedestrians from wandering over to stand or sit by the giant cables or the curb. I could totally have seen that happening if the fence wasn’t there. For this purpose I think they will work great. Jose Rose is just terrible. What a ridiculous headline. we were fleeced $70K for that? When I read articles like this I’m glad I moved out of Portland. I have been nervously watching the developing bus infrastructure all around this bridge – especially on the east side. Bus malls, bus turning lanes, bus idling zones, etc. There are some very clear “bus first” aspects to the traffic design – including one bus-only road spur that crosses the new bike path at SE 8th/Division place: guess who gets the stop signs – bikes/peds. Buses get to roll through across the MUP with no stopping while MUP has a stop sign. I am afraid that the whole project is very “bus-first” with regard to mixed mode traffic. It’s not clear to me how many bus lines will cross the new bridge – hopefully not too many, but from the looks of all the new bus facilities they are adding, I would expect they are going to change many lines to come in to the new hub and bus-Max link-up. Y’all could really learn from Tulsa on this one. Since the Idaho Stop came to Oklahoma 4 years ago, most of the stop signs facing cycleways have been changed over to Yield, with the only remaining ones being pretty close to suicide if you run ’em. Most neighborhood streets (with the exception of a few far flung and new residential subdivisions with no urban amenities, as well as cross streets to bike boulevards and section line roads) have two- or four-way yields. Then again, we got some experience with this, Tulsa Police came up with the concept of a yield sign so we’ve had them the longest. Is there much of a point to have an Idaho Stop law if you just change all the stop signs to Yield anyway? It obviates the expectation to all traffic at the intersection. That and if bicycles and motorcycles can safely do it, odds are larger vehicles are going to be able to do so as well. From an engineering perspective, if you’re seriously considering or have passed an Idaho Stop law, odds are you need to seriously re-evaluate traffic signal operations and what warrants a stop sign versus more lenient traffic control. How in the world does a 4-way Yield work? The same way a four way stop works with the Idaho Stop. Traffic coming from your right has priority. Traffic from your left should yield to you. my only complaint thus far is the lack of gates to stop cross traffic on Moody for crossing buses or Max trains. Somebody (on a bike) is going to get hit by running the light. 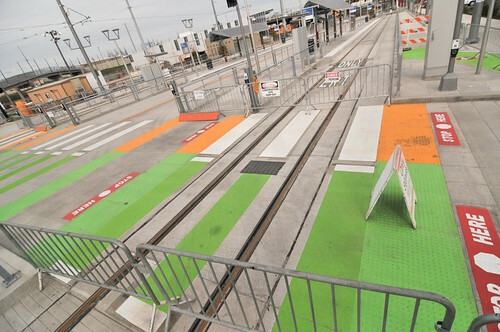 They’re trying to educate riders now, but it seems inevitable after talking with the DOT guys on Moody a few days ago. They’re hoping that gates are installed across the cycle track. I have to agree. I said the same thing above. I just don’t see why the wouldn’t put gates there. MAX trains run on and cross roadways all over the city, without gates, and cyclists are not getting mowed down by MAX trains. I don’t see why gates are necessary here in particular. Yes, a rider who is totally reckless could ride in front of the train, as he could ride in front of a car, bus, or MAX train at any other crossing. Can’t protect against every possible bad decision. There is no equivalent to this intersection around the city. This is a completely separated pathway (that previously had no lights or stops) that insects with a rail line. This bridge has been very exciting for me to see up close, which I have, because I’m going regularly to the Life Sciences building for some of the fine work done by dental students there. In terms of functionality and aesthetics, it’s generally a beautiful designed bridge. A few reasonable quibbles here and there I suppose, but hopefully nothing major. Myself, I would have liked the modern design aesthetics of the bridge masts to have been little more graceful, but they’re ok. The Life Sciences building is beautiful itself, inside and out, and a great neighbor to the bridge. When I arrive in the mornings, I see many people traveling by bike on the street on the west side of the building…Moody, I think it is. Super nice plaza overlooking the river, on the east side of the building. Quality of south side coffee shop and deli sidewalk seating, looking square at the west end approach to the bridge, are hard to beat. It seems as though this quite unique bridge is going to be very good for Portland. Wonder how long until Portlanders go “lolnope” on the lane markings and direction and mode of travel restrictions as seems to be the case per the norm as evidenced by cars and bikes in the bus lanes, cars and busses in the bike lanes, bikes on the sidewalks, pedestrians everywhere but the sidewalks, and one way and center lines/medians practically being a suggestion. Do you ride on the Hawthorne Bridge? Bikes and pedestrians coexist quite well there. Pedestrians almost all stay on the pedestrian marked side, cyclists usually stay on the bike marked side. The cyclist has to keep his speed moderate, but that’s not a big deal. It works fine. The new bridge will work even better. If you say so. 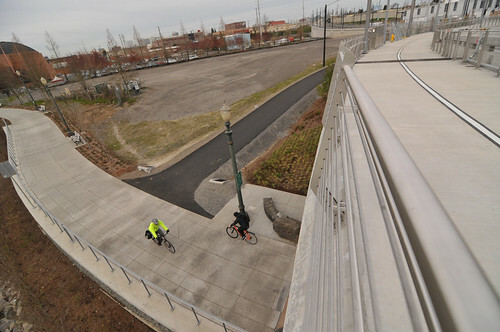 The Hawthorne Bridge, Willamette Greenway, Katz Esplanade and the Springwater Corridor west of 82nd and to a lesser extent within Gresham city limits are examples of the MUP concept not scaling. All of these have been in desperate need of having, at a minimum, a suicide passing lane and a sidewalk, preferably full division, a sidewalk and two lanes each way. Portland’s dedicated cycleways leave a LOT to be desired. The City That Works stopped working on it not even halfway through. Portland spent a lot of money on minor feeder routes in the cycleway network (the bike lanes on major automobile thoroughfares) but phoned it in on the trunks. The Springwater Corridor’s not even wide enough in most places to even mark a centerline and still have lanes meet the engineering minimum width of 6 feet thanks to being 9-10 feet wide. Tulsa’s planning ahead. The main north/south cycleway out of downtown along the east side of the Arkansas River (Riverparks Eastside Cycleway) is a good example. Running from the intersection of USBR 66, Newblock Park Cycleway and Riverside Drive on the southwest corner of downtown, it runs south along the river to the Creek Turnpike across the river from Jenks currently. For most of it’s route, it’s segregated: Three lanes, two for bikes, and a pedestrian shoulder at a minimum. For most of the run north of 71st Street (about 6 out of the 7 miles), the pedestrian path is fully separate from the cycleway, divided by a raised, grassy median. There’s plans to extend the cycleway south to Bixby from Jenks at some point, and the sections where the pedestrian path is still attached to the cycleway, there’s plans to detach it and move it behind a median. 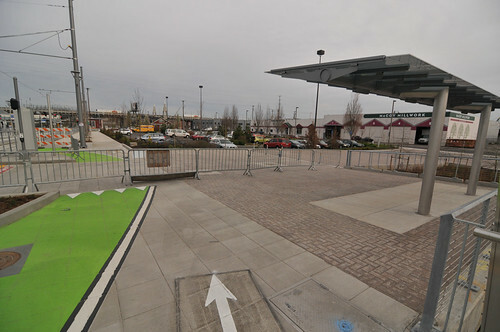 Space has been reserved to convert the cycleway from a two lane undivided route to a four lane divided route, with a separate path for pedestrians (three roadways): Basically what the Portland area cycleways above should have been converted to 20 years ago, undivided south of the Creek Turnpike/Jenks, with a sidewalk. The trunks are there, and the feeder system is being developed. So, the Oil Capital of the World is showing what a New Kind of Energy really looks like. Give it ten years. Portland will be just as swamped as it is now as the cycleway network completes it’s capacity saturation (it already does this from the Hawthorne Bridge to the Gresham city line on warm, dry days) on. 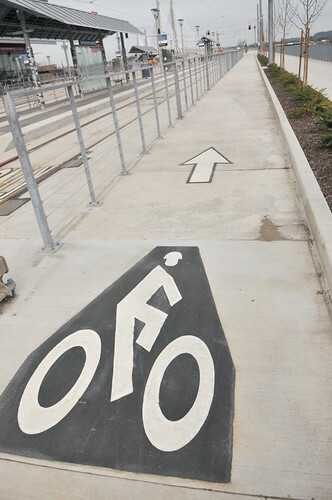 Tulsans will be going as fast or slow as they want on bicycle superhighways. That said, would be cool if the Winterhawks jumped from the WHL to the ECHL, the ‘hawks and the Oilers would be pretty evenly matched. Ummm… I think we have different ideas of what constitutes “quite well.” I think the Hawthorne Bridge is a high-stress environment for both walking and riding due to not enough space for either. Very cool. Excited about this bridge. I’d like to order 6 more, please! 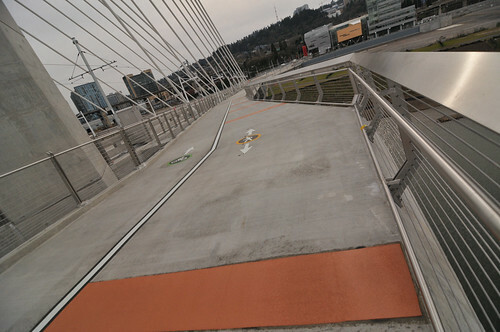 I rode around the western terminus of the bridge down by the OHSU Life Science bldg yesterday at around noon. Lots of activity by TriMet staff was apparent everywhere, and lots of signs near the current bike path paralleling Moody warning cyclists of changes to come, of new lights to notice, and how all this was necessary to prevent injury. As I stopped at a red light I asked an older gentleman standing nearby in what I think was a blue TriMet uniform what was going on and he informed me that they were training the bus drivers how to safely negotiate the intersection. As we both gazed out at the gordian knot of tracks, lanes and paths with the multiple intersecting marker lines on the concrete in front of us he chuckled and pointed up towards the big hospital on the hill behind us and said “good thing that’s up there nearby!” I didn’t ask him to elaborate, but I believe his meaning was obvious. But overall, can’t wait to ride this bridge. Wow. Brutal. I completely missed that. You are entirely correct. That must be in violation of some sort of OSHA standard, if nothing else. Take a look at this photo — if you are falling down and hit the top of one of the “fenceposts” you’ll have a very bad landing. I don’t recall seeing a precedent for this anywhere. So I suspect there is some design code somewhere that says that public rails on public walkways should be designed so as not to impale people if they accidentally fall on them. Looking at that picture again, I see why the bike side is a foot wider than the ped side. On the pedestrian side, the railings are displaced outward by the angled base of the posts, making all six feet, four inches of the pedestrian side pavement usable. Accounting for a two-foot “shy distance” to keep handlebars away from railings, only five feet, eight inches of the bike side pavement is actually usable. How dare bike infrastructure have corners and hard surfaces! Why was this bridge not built as a giant bouncy castle? 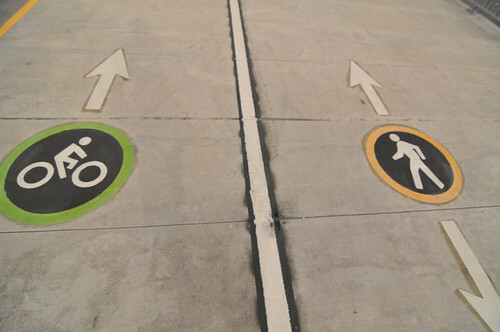 I love the separated cyclist and pedestrian icon and arrows. I wish PBOT would put those in anywhere over a certain width, like Hawthorne bridge and busy sections of the esplanade. A little bit of suggestive order means a lot less weaving a close calls for everyone. I’m all for completely separate pedestrian facilities, or curb-elevated pedestrian ones. Obvious to all. In NYC, a portion of the Hudson River Trail runs on the west side of West St., with separate ped and bike lanes and separate traffic lights, too, all well signposted. Saw a YouTube video of the northbound ride from the World Trade Center/Freedom Tower area to the George Washington Bridge awhile back. Looked great. Both ped and bike lanes were one lane each way, with ped and bike lanes separated by small trees and flowers. Looked well-thought out. A friend and I rode the Tillikum around midnight tonight, I do kind of like the little viewpoint spots, (there is only one security guard however and he’s not the brightest bulb on the tree so if you have at least one other person to help you shuttle bikes over/around the security fences it’s totally fun and doable! I demand rub bars for tall bikes and recumbants. “Starbucks and another retailer” ??? That would be Elephant’s. Why do you call out the big national chain but anonymize the local business? I’m guessing because there’s just not that many local businesses, and fewer that people would recognize even living there (though Elephant’s is kind of a big one to overlook in Portland). Was actually kind of a shock for me moving to Tulsa from Portland, not due to the lack of selection, but because local businesses outnumber the big chains in a huge way. Even some of the largest employers in Tulsa are local businesses (and in a few cases, started here and later went national). Can’t wait to walk it myself starting tomorrow!